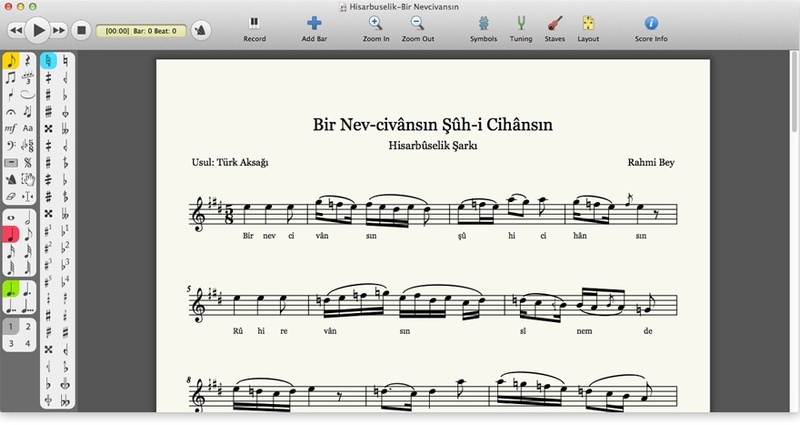 Mus2 2.0.6 – a music application designed for the notation of microtonal works and Turkish maqam music. Mus2 is a music application designed for the notation of microtonal works and Turkish maqam music. Tasks that require cumbersome workarounds in other notation software are extremely easy to accomplish in Mus2. Mus2 has been designed to make it easy to work with non-12-TET tunings and pitch systems, such as 53-TET used in Turkish music. In Mus2 you have complete freedom to define what pitches the lines and spaces of a staff represent–in absolute frequencies or in cents and as rationals, relative to the first pitch of a scale. Moreover, a scale can have any number of pitches. Import symbols from vector graphics and music fonts into Mus2 to create your own accidentals. Not only can you easily adjust the layout and musical meaning of these symbols, you can also use them with notes and in key signatures just like any other accidental. For a quick start, Mus2 comes withquartertone symbols and accidentals used in Turkish classical and folk music. Hear your score performed by sampled acoustic and electronic instruments in any tuning. Mus2 understands and plays back the articulations, ornaments, dynamic markings and other symbols in your score. The polyphony (number of simultaneous notes) limitation commonly found in other MIDI-based microtonal solutions does not exist in Mus2. When you do need the sound processing capabilities of other music software, simply export your score as a MIDI, Wave or AIFF file. Connect a keyboard or any other MIDI-compatible instrument and record music in any tuning. You can create key mappings for your tunings to assign each key to an arbitrary pitch and, thanks to Mus2’s microtonal sampler, get real-time intonationally accurate playback. Once you’re done recording and editing with the built-in sequencer, simply copy the recorded passage and paste it onto a staff. All the notation tools in Mus2 are in the toolstrip at the left edge of the screen. The toolstrip prevents visual clutter by showing the options that apply to the currently selected tool only. To add a symbol to the page, choose it from the toolstrip and click on the page–the symbol is automatically placed, and overall layout updated as necessary. You can use Mus2 with the same familiar interface and features in Windows and Mac OS X. Next story PicCollage 1.1.1 – The new generation collage maker. Previous story Jump Desktop 4.0.4 – Remote desktop utility. NoteAbilityPro 2.601 – Music notation package.